Bali is the place where you will be first stormed by an abundance of impressions, noise and smells, just to find bliss shortly thereafter. Being referred to as the „island of gods“, it holds many secrets in store about ancient temples, mighty deities and traditional life which evolved during the rise and fall of the different kingdoms being once in charge. Today, Bali welcomes travelers from all over the world, keeping different promises depending on the kind of tourist addressed to. The lovely Indonesian island has it all: a thrilling nightlife for the sleepless party tourists alongside peaceful oases to relax and immerse yourself in local life. 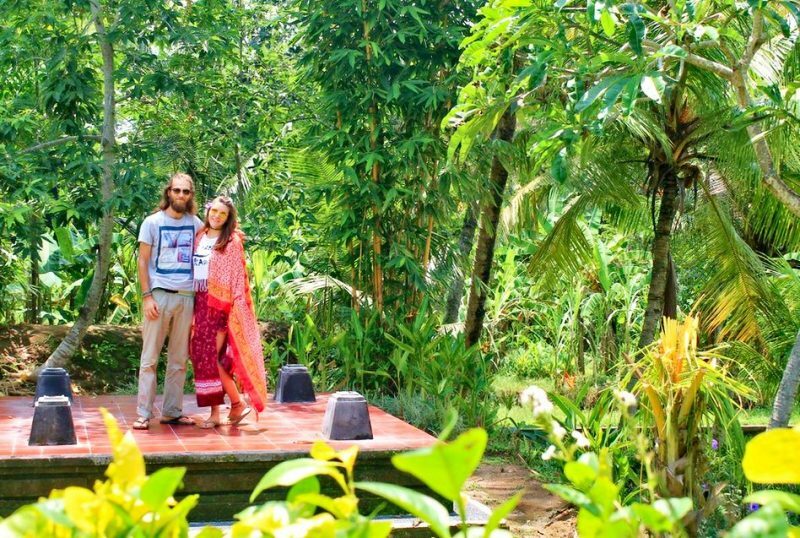 We spent 1 month in Bali, turning it upside down in the search of bliss and adventure. Get ready to uncover the best kept secrets of this island as seen through our eyes! Curious about more best kept secrets? Read those of Prague or Lisbon. If you’re craving for a laid back place surrounded by green getaways but still don’t want to miss out on the island’s hustling and bustling, Ubud is the place to be. 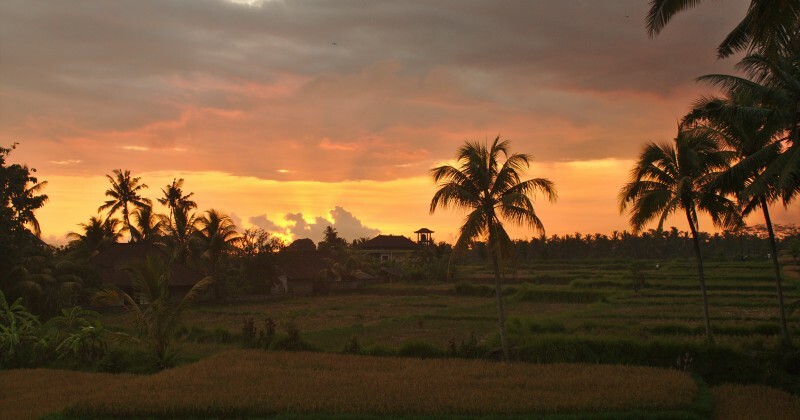 Located directly in the heart of the island, Ubud is the center of culture and arts. Everything you see and experience in this certainly spiritual place, will help you to grasp the rich Balinese cultural heritage and how it blends into everyday life. 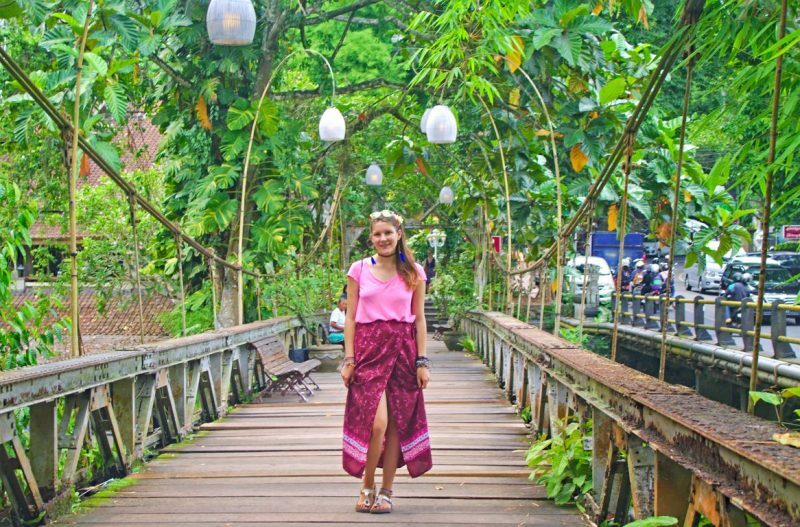 If you want to explore the surroundings, Ubud is a great place to stay and start your trips from. 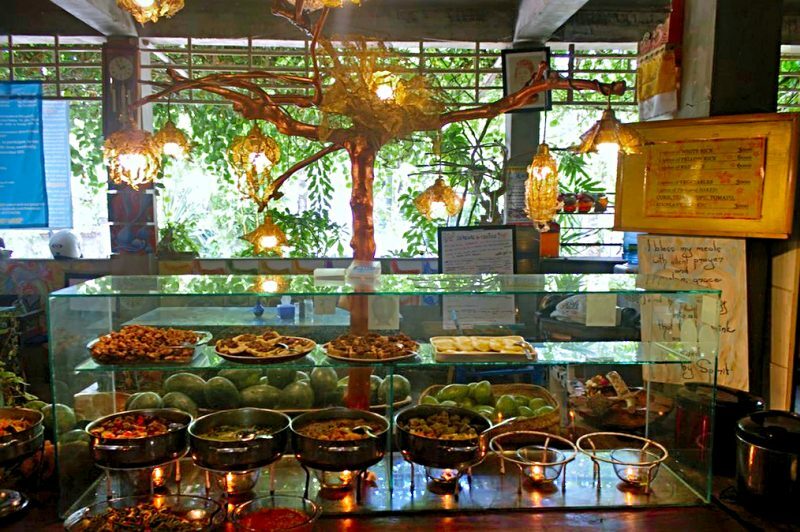 Every day a buffet is served consisting of vegetarian and vegan food. You’re free to pay how much it is worth to you. Keep in mind that this place can only be maintained by the volunteers if you compensate fairly what you take. 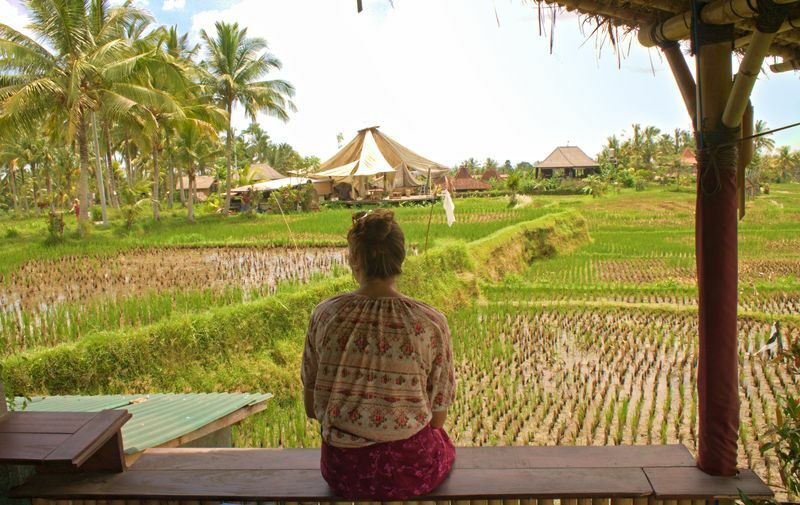 If you need detailed information on where to find cheap accommodation and food, read our budget article for Ubud. The Campuhan Bridge is an iconic remnant of a time when Indonesia was a Dutch colony. It crosses the Wos river ravine and ends at a restaurant with the matching name „Bridges“. Sometimes you can see vendors selling crafts and clothes on this bridge. Be careful when crossing the bridge as the wooden ground can be damaged in some parts. Just below the Campuhan bridge where the Wos river meets the Ayung river, you can find a holy place popular for offering ceremonies. We were just in time when two Balinese women prepared canangs (daily offerings), which are basically square woven baskets filled with flowers, incense sticks and gifts to the gods. The Hindus believe that the incense smoke carries the essence of an offering, referred to as sari to the gods in heaven. If you want to learn more about offerings you can do that while reading our article about the Hindu baby ceremony. 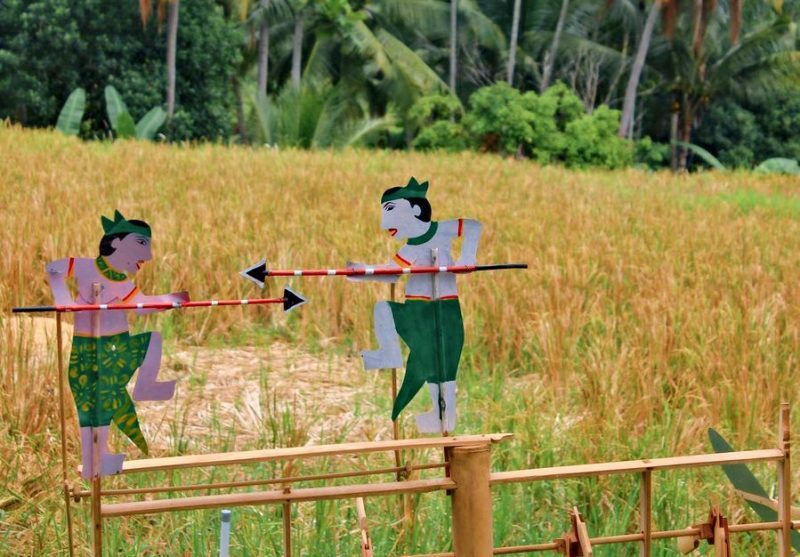 There is more to Bali than rice paddies. We were surprised to find a huge flower field just next to the road. Throw yourself into a sea of exotic fragrances. And yes rice paddies are still awesome especially if you observe them from a scenic place like from the balcony of Kiss me Ketut. This warung makes the perfect location to wrap up the day over a fresh juice or beer. Food can be ordered too. If there is an award for a Coffe place with the most gorgeous setting, then it would go to Cafe Lotus. The terrace reaches into a magical garden with Lilly ponds and Orchid trees. 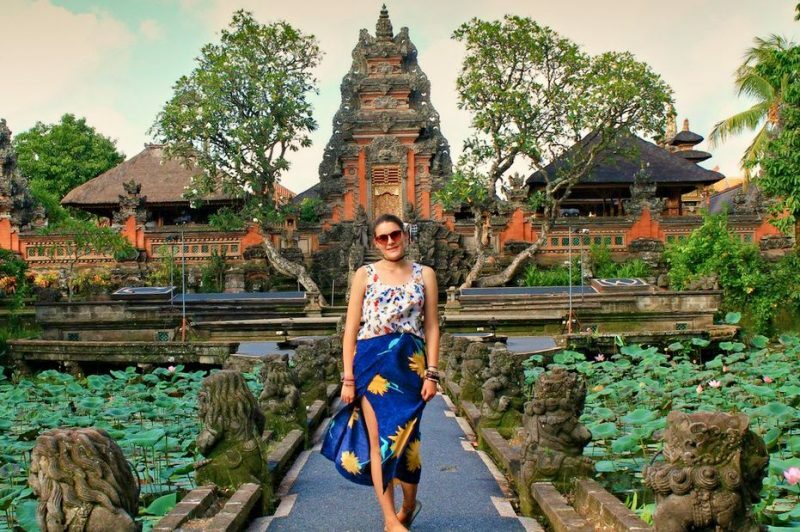 Right at the end of the scenic path you can discover one of Ubud’s most charming temples. 9 Angels Warung is not your usual Vegetarian restaurant because here you won’t find any waiters handing you out the daily menu neither there are fixed prices for the different dishes on the buffet. Mutual trust and sharing are two principles, the concept of this restaurant is based on. After you finished your meal leave a donation in one of the jars on the table. Try to keep in mind how many spoons you took from each dish because you pay per spoon not per kilo or plate. If you’re short on money, there is no need to feel guilty. Just sign up for voluntary help by proposing a skill that can be cashed in for the amount you’re in debt. Sometimes, it can even happen that someone already paid for your meal assuming that there would be someone in need of help. You can find out by checking the tags on the board written by guests of both sides – those who offer and those who are in need. If you see a voucher in one of the jars, it would be a noble gesture to pay for the person who redeemed it. Of course only if you have those extra bucks. This idea of compensating food for trading in a skill, makes the 9 Angels Warung a truly social place with a lot more in store than just serving food. This place also hosts various events such as Salsa, Yoga and other creative workshops. If you don’t feel like attending any of these, you can just come here to relax, grab a book from the book shelf or enjoy the artworks and crafts. Translated as „Land in the sea“, Tanah Lot is a place of serenity with a world-famous temple sitting on a rock. During high tide, the temple is flooded by the sea, making it the perfect backdrop for a photo. Sometimes you don’t need to travel far to find an oasis to yourself. 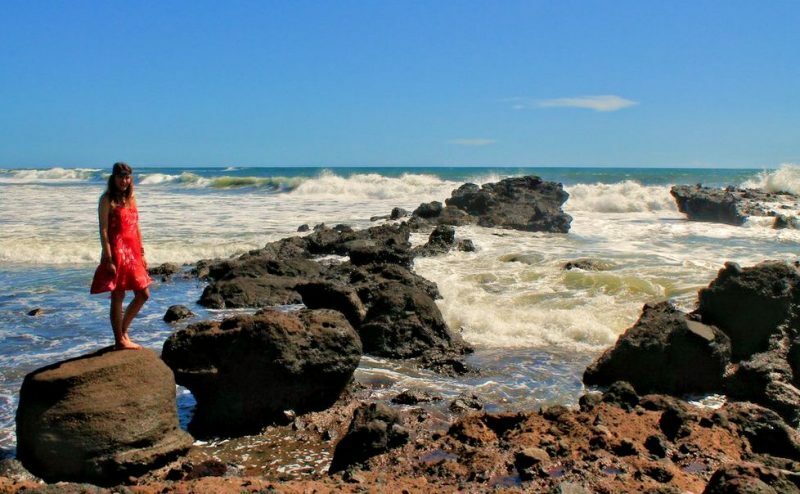 The „Black Beauty“ or officially called Amed is a coastal strip in the North East of Bali dotted with numerous volcanic sand beaches. You will see many fisher boats off the shore here as it’s the territory of the local fishermen. Bali has more waterfalls than any other place we traveled so far, 18 to be precise. Although we were not able to visit all of them, we scratched quite some from the list which you can find in our article about Bali’s waterfalls. 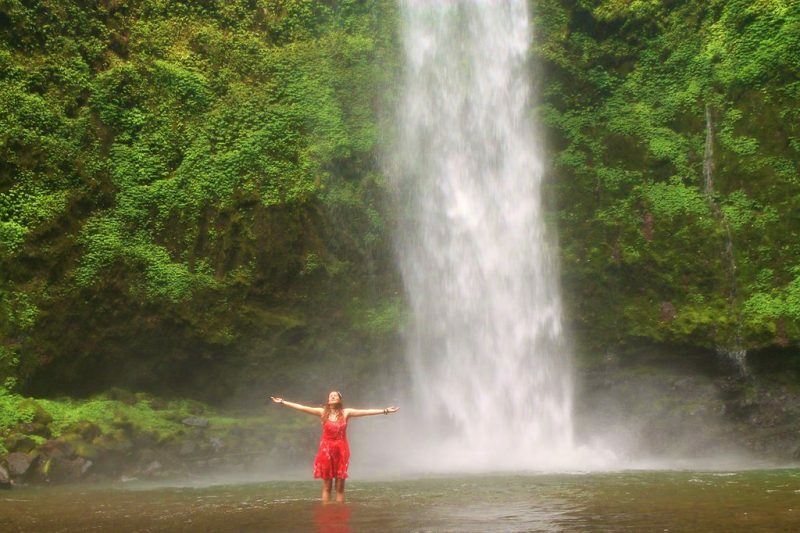 The majority of the people targets the Tegenungan waterfall while other waterfalls remain in the hands of the locals. Nungnung is one of the less visited waterfalls, captivated in the photo above. The water rushes in a perfect vertical line downwards, carrying the cool mist miles away. 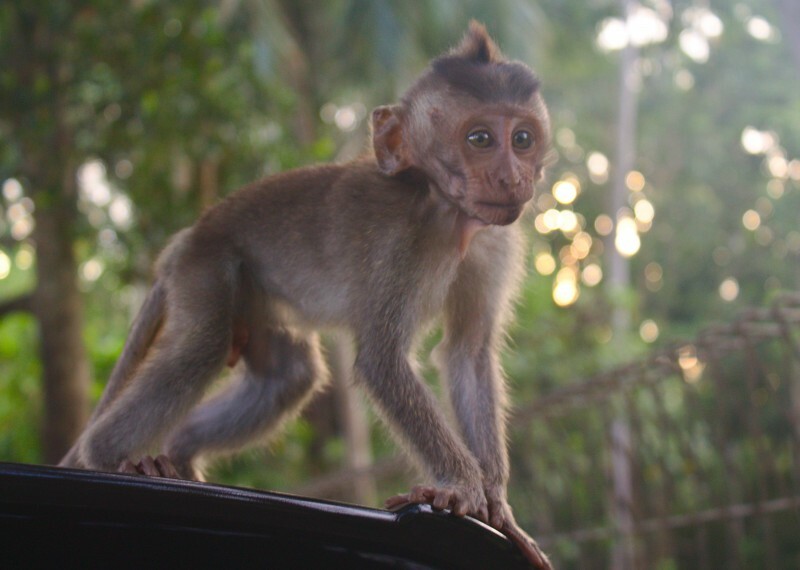 A trip to Ubud cannot be completed without seeing the monkey show and the best is that you don’t need to visit the Monkey Forest of Ubud for this purpose. 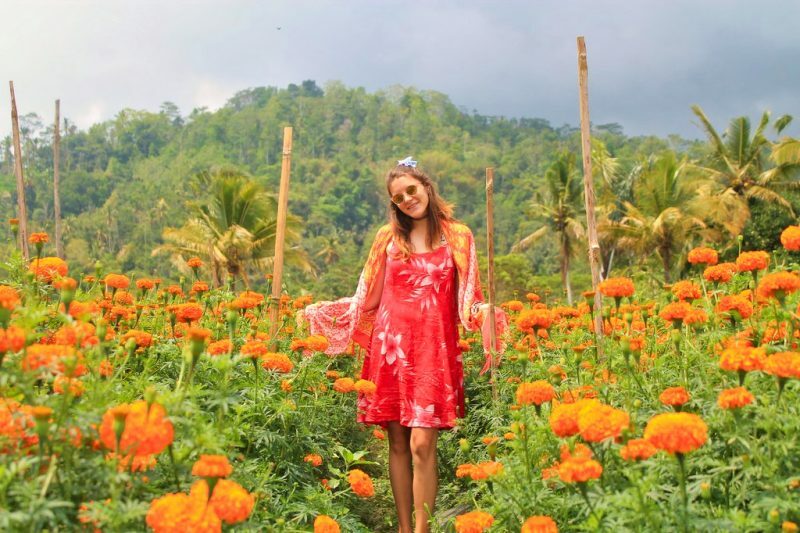 If you read our article about 15 things to do in Ubud for the budget traveler, you will come across a hint how to experience the monkey parade without paying a cent admission fee. 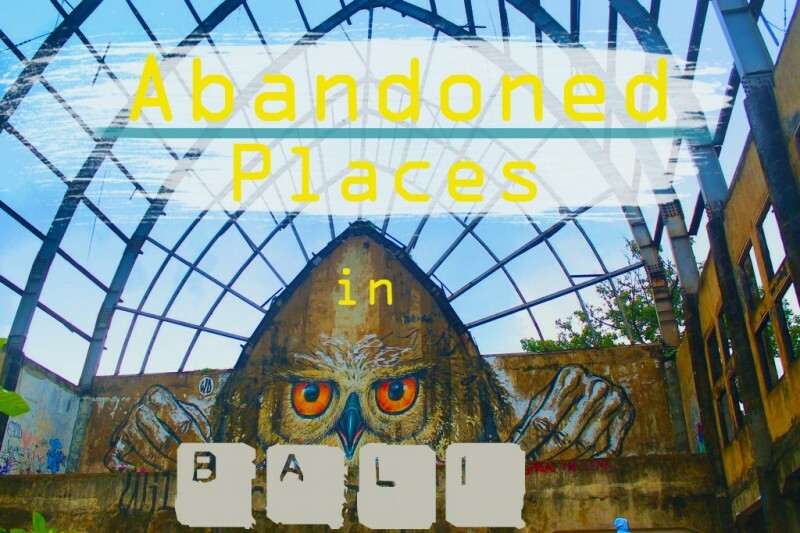 Bali has a range of abandoned places from a theme park turned into a street arts gallery to two planes rusting on the ground. Read the bizarre things we have discovered in these places. There are more abandoned sites in Bali for those seeking eerie experiences. The picture of the glowing sky when the sun sets over the rice fields will captivate you for a lifetime. To find magic in Bali you sometimes don’t need to do much more than follow your heart and take that turn into the side street. That’s the strategy we followed most of the time. Getting lost and still finding ourselves somewhere among lush green with monkeys stealing cookies out of offerings initially honored to the gods or being part of a traditional Hindu ceremony learning from foreign cultures and their rituals. Bali is a place where world religions come together. It’s a place where calm and noise take turns. It’s a place where everyone can find its own little paradise if it’s a temple, a beautiful landscape, a yoga retreat or just some fresh and healthy food.